PanARMENIAN.Net - Deputy Chairman of Gazprom Management Board Vitaly Markelov will on Friday, November 11 hold talks with Iran's Deputy Minister of Oil Amir-Hossein Zamani-Nia, who has arrived in Moscow to convince Russian companies to invest in the Islamic Republic's oil and gas projects. 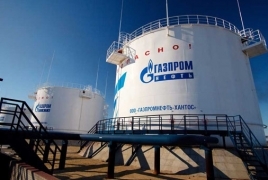 Also, negotiations may dwell upon the increase of gas supplies from Iran to Armenia, whose gas transportation system is controlled by Gazprom, Kommersant reports. Now Gazprom supplies gas to Armenia through Georgia, but the transit agreement expires at the end of 2016, and Gazprom is keen to reduce the fee. Negotiations with Iran would strengthen the Russian company's position and put more pressure on Georgia,the publication says. Earlier,Iran signed a deal with France's Total on for the development of gas production at a major offshore field in the Gulf.The Heads of Agreement (HOA) for the development of Phase 11 of the important South Pars field is worth $6 billion (5.4 billion euros).